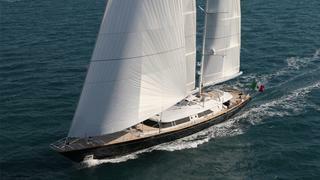 Sailing superyacht Silvana is currently for sale with Camper & Nicholsons. This 56 metre yacht was built in aluminium by Perini Navi with naval architecture by Ron Holland and was delivered in 2008 as one of only two 56 metre yachts from the yard. 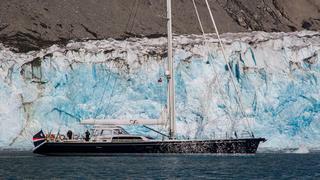 Silvana's statistics are impressive in that she has a 58.8 metre main mast and a 48.26 metre mizzen mast, both in aluminium, while her furling boom is in carbon fibre. Under way, she carries 1,500 square metres of sail. An interior in neutral colours and light limed oak accommodates 12 guests in five generous cabins, two with Pullman berths and she has proved to be a popular charter yacht. Under power, her twin Caterpillar C32 engines give her a range of 3,600 nautical miles at 13 knots. Silvana is asking €24 million. 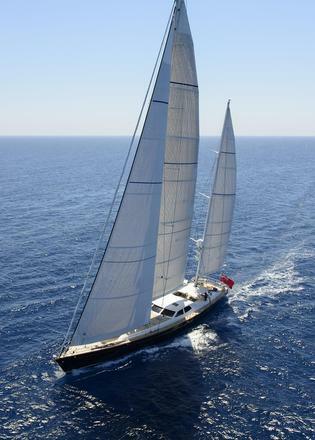 Sailing superyacht Silvana is currently for sale with Camper & Nicholsons. This 56 metre yacht was built in aluminium by Perini Navi with naval architecture by Ron Holland and was delivered in 2008 as one of only two 56 metre yachts from the yard. Silvana's statistics are impressive in that she has a 58.8 metre main mast and a 48.26 metre mizzen mast, both in aluminium, while her furling boom is in carbon fibre. Under way, she carries 1,500 square metres of sail. An interior in neutral colours and light limed oak accommodates 12 guests in five generous cabins, two with Pullman berths and she has proved to be a popular charter yacht. Under power, her twin Caterpillar C32 engines give her a range of 3,600 nautical miles at 13 knots. Silvana is asking €24 million. The historic 39.56 metre classic J Class sailing yacht Endeavour is listed for sale by Edmiston & Company. Designed by the legendary C E Nicholson, she was built by UK yard Camper & Nicholsons and delivered in 1934 with the specific target of winning that year’s America’s Cup. Unfortunately Endeavour was defeated but her gorgeous lines and sailing performance continue to impress sailing enthusiasts today. The 81 year-old yacht was relaunched on 10 October 2011 having undergone a major 18-month refit at New Zealand yard Yachting Developments. Used only privately since the refit, she now offers accommodation for eight guests in a master suite and two doubles with en suite facilities and a twin with bunk beds. Endeavour is asking €19,950,000. 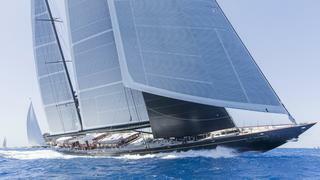 The historic 39.56 metre classic J Class sailing yacht Endeavour is listed for sale by Edmiston & Company. Designed by the legendary C E Nicholson, she was built by UK yard Camper & Nicholsons and delivered in 1934 with the specific target of winning that year’s America’s Cup. Unfortunately Endeavour was defeated but her gorgeous lines and sailing performance continue to impress sailing enthusiasts today. The 81 year-old yacht was relaunched on 10 October 2011 having undergone a major 18-month refit at New Zealand yard Yachting Developments. Used only privately since the refit, she now offers accommodation for eight guests in a master suite and two doubles with en suite facilities and a twin with bunk beds. The 39.95 metre sailing yacht Angel's Share is offered for sale by KK Superyachts. 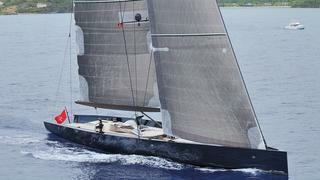 Built in carbon fibre by Wally Yachts to RINA class, she was delivered in 2009. A refit followed at Germany’s Lürssen yard in 2010, proving so successful that she was named Refit of the Year at the 2011 World Superyacht Awards. Accommodation on Angel's Share is for 10 guests in four cabins consisting of a master suite, a VIP suite with two Pullman berths and two convertible cabins, all with en suite shower facilities. Under power, a 450hp MAN engine gives her a cruising speed of 12 knots, and she was last refitted in 2013. Angel's Share is asking €12,950,000. The 39.95 metre sailing yacht Angel's Share is offered for sale by KK Superyachts. Built in carbon fibre by Wally Yachts to RINA class, she was delivered in 2009. A refit followed at Germany’s Lürssen yard in 2010, proving so successful that she was named Refit of the Year at the 2011 World Superyacht Awards. Accommodation on Angel's Share is for 10 guests in four cabins consisting of a master suite, a VIP suite with two Pullman berths and two convertible cabins, all with en suite shower facilities. Under power, a 450hp MAN engine gives her a cruising speed of 12 knots, and she was last refitted in 2013. Angel's Share is asking €12,950,000. Sailing superyacht Antares of Grand Cayman is for sale with Y.CO and Burgess. 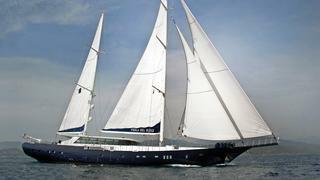 Designed by Dixon Yacht Design, this 39.98 metre yacht was built in aluminium by Holland’s Royal Huisman yard and delivered as a cutter-rigged ketch in May 2005. An Art Deco interior is the work of Rhoades Young Design featuring French walnut wood throughout with fine detailing. MCA compliant, Antares of Grand Cayman accommodates up to nine guests in four cabins consisting of an aft master suite with a king sized bed, a VIP suite to port and a starboard twin cabin with a Pullman berth. An office/study can also be converted into a double cabin and all cabins have full en suite bathroom facilities. Under power, an MTU 8V 2000 M70 engine gives her a cruising speed of 13 knots. Antares of Grand Cayman is asking €12.5 million. Sailing superyacht Antares of Grand Cayman is for sale with Y.CO and Burgess. 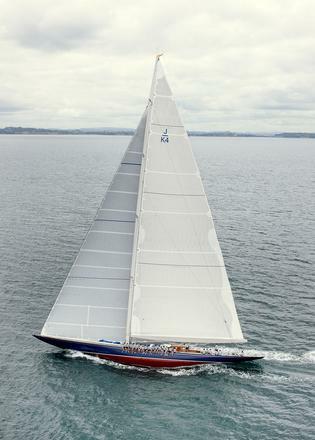 Designed by Dixon Yacht Design, this 39.98 metre yacht was built in aluminium by Holland’s Royal Huisman yard and delivered as a cutter-rigged ketch in May 2005. An Art Deco interior is the work of Rhoades Young Design featuring French walnut wood throughout with fine detailing. MCA compliant, Antares of Grand Cayman accommodates up to nine guests in four cabins consisting of an aft master suite with a king sized bed, a VIP suite to port and a starboard twin cabin with a Pullman berth. An office/study can also be converted into a double cabin and all cabins have full en suite bathroom facilities. Under power, an MTU 8V 2000 M70 engine gives her a cruising speed of 13 knots. Antares of Grand Cayman is asking €12.5 million. The 54.6 metre sailing yacht Marie is jointly listed for sale by Hoek Brokerage and Fraser Yachts. Designed by Andre Hoek, she was built in aluminium by Dutch yard Vitters and launched in 2010, going on to be a finalist at the 2011 World Superyacht Awards. Marie accommodates up to 10 guests in four cabins laid out as a large master suite with a king size bed and his and hers en suite bathrooms, a VIP suite also with a king size bed, plus a port and starboard twin with Pullman berths, all with en suite facilities. The interior was designed by David Easton and the wood in the saloon and throughout the yacht is anigre, creating a warm, light atmosphere. Extensive deck spaces include an al fresco dining area on the foredeck while aft of the deckhouse is the large covered cockpit with cushioned seating and drinks tables. The price of Marie is available on application. The 54.6 metre sailing yacht Marie is jointly listed for sale by Hoek Brokerage and Fraser Yachts. Designed by Andre Hoek, she was built in aluminium by Dutch yard Vitters and launched in 2010, going on to be a finalist at the 2011 World Superyacht Awards. Marie accommodates up to 10 guests in four cabins laid out as a large master suite with a king size bed and his and hers en suite bathrooms, a VIP suite also with a king size bed, plus a port and starboard twin with Pullman berths, all with en suite facilities. The interior was designed by David Easton and the wood in the saloon and throughout the yacht is anigre, creating a warm, light atmosphere. Extensive deck spaces include an al fresco dining area on the foredeck while aft of the deckhouse is the large covered cockpit with cushioned seating and drinks tables. The price of Marie is available on application. The 42.2 metre sailing yacht Perla Del Mare is listed for sale with Ocean Independence. Designed by Studio Naval, she was built in mahogany and epoxy resin by Turkey’s Saba Yacht yard and delivered in 2010. A large, airy interior is filled with natural light due to her large windows, and she can accommodate up to 12 guests in six cabins. The accommodation layout of _Perla Del Mare _is flexible and consists of two king size doubles, three queen size doubles and a twin. All staterooms have full en suite facilities. Deck spaces offer plenty of rest and recreation spaces including an aft deck with a table and chairs for 12 guests. Under power, twin Volvo Penta engines give her a range of 1,310 nautical miles at her cruising speed of 11 knots. Perla del Mare is asking €4.5 million. The 42.2 metre sailing yacht Perla Del Mare is listed for sale with Ocean Independence. Designed by Studio Naval, she was built in mahogany and epoxy resin by Turkey’s Saba Yacht yard and delivered in 2010. A large, airy interior is filled with natural light due to her large windows, and she can accommodate up to 12 guests in six cabins. The accommodation layout of _Perla Del Mare _is flexible and consists of two king size doubles, three queen size doubles and a twin. All staterooms have full en suite facilities. Deck spaces offer plenty of rest and recreation spaces including an aft deck with a table and chairs for 12 guests. Under power, twin Volvo Penta engines give her a range of 1,310 nautical miles at her cruising speed of 11 knots. Perla del Mare is asking €4.5 million. The 29 metre sailing superyacht Infinity is listed for sale with Yachting Partners International. Award-winning designer Philippe Briand created her lines and she was custom-built in aluminium by French yard CNB with delivery in 2008. Infinity sleeps eight guests in four well-appointed cabins and offers wonderful sailing speeds. A comfortably-sized yacht in excellent condition, she has plenty of space with lots of performance. She had a thorough maintenance period in winter 2014/2015 and was recently reduced by €500,000 by an owner keen to sell. Infinity is asking €3,750,000. The 29 metre sailing superyacht Infinity is listed for sale with Yachting Partners International. Award-winning designer Philippe Briand created her lines and she was custom-built in aluminium by French yard CNB with delivery in 2008. Infinity sleeps eight guests in four well-appointed cabins and offers wonderful sailing speeds. A comfortably-sized yacht in excellent condition, she has plenty of space with lots of performance. She had a thorough maintenance period in winter 2014/2015 and was recently reduced by €500,000 by an owner keen to sell.